A tour of the London Transport Museum in Covent Garden which can be found in the old Flower Market building) is an enjoyable and informative way to pass a few hours. The tour starts on the upper floor, where the visitor first learns about the growth of London during the nineteenth century and how the heavily congested streets with their horse drawn vehicles, led to the creation of the world's first underground railway. Building on the development of over ground railways, the first part of the Metropolitan Railway began construction in the 1860s. The cut and cover tunnels were superseded by the first tube tunnels when the City and South London Railway (now part of the Northern Line) were constructed in the 1890s. The history of these, and later underground lines, can be followed at the museum, as can the evolution of London's road transport system. By 1915 horse drawn cabs, buses and coaches were replaced with motorised vehicles, resulting in the iconic black cabs and red buses that are still a major part of London's cityscape. Contemporary visitors to London may not realise that there were also trams and trolleybuses on London's streets, but that these were all phased out in favour of the modern double-decker, single-decker and bendy buses that we use today. The museum boasts genuine examples of some of the earlier horse, rail and road vehicles, several of which can be boarded by today's visitors. It is not only a place for historians; you can also learn about present day transport, as well as plans for the future, admire the artistry of the London Tube Map, and be reminded of the roles played by the underground stations as air raid shelters during World War II. 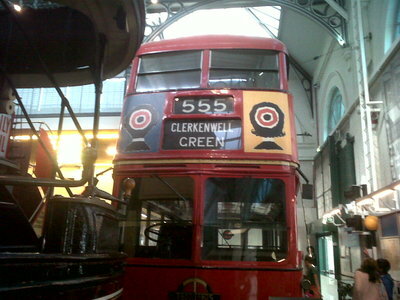 The London Transport Museum is situated at 39 Wellington Street, London WC2E 7BB and is a short walk from Covent Garden station. Other nearby stations are at Leicester Square, Holborn and Charing Cross. Bus routes RV1, 9, 11, 13, 15, 23 and 139 all run through the nearby Strand and Aldwych. Why? See the evolution of London’s road transport system.